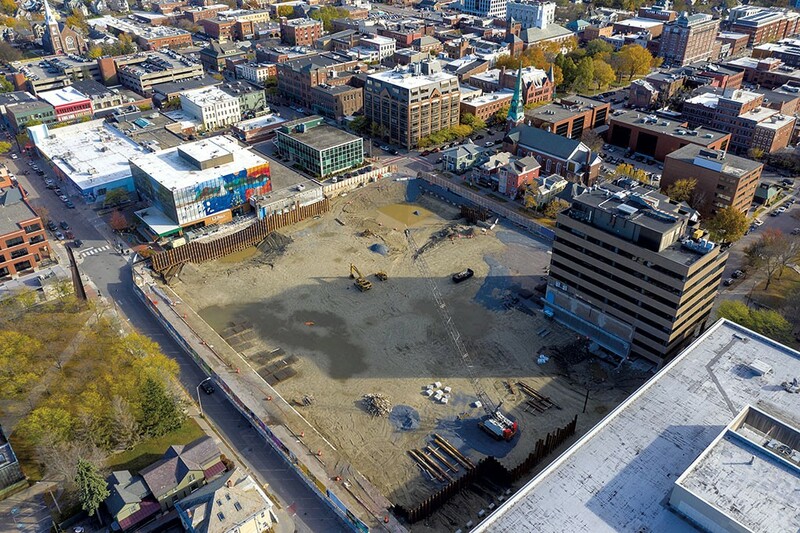 A series of construction deadlines for the downtown CityPlace Burlington project have come and gone without any real progress, and city officials appear to be losing patience with the developer. Don Sinex vowed two years ago that the 14-story mall redevelopment would be open and occupied by January 2019. Later he said that the foundation would be poured by that date. The construction financing and tenant commitments have not come through, either. Last week, as snowflakes drifted into the gaping dirt hole in downtown Burlington, Sinex declined to make any more time-specific promises. He has been evasive with city officials for two months, according to emails obtained as part of a public records request, and would not provide Seven Days with an updated time line. If erected, CityPlace would be the tallest building in Vermont, with 288 apartments, 230,000 square feet of office space, and parking for hundreds of cars, plus a grocery store, a preschool and retail space. Now city officials are considering new ways to prod the New York City-based developer to get shovels in the ground. On Tuesday, Neale Lunderville, interim director of the Community & Economic Development Office, and a city consultant, Jeff Glassberg, will update the city council on the project. Their recap could determine next steps. The city's development agreement with Sinex and his company, Devonwood Investors, offers Burlington some leverage, including the opportunity to take the developer to court if he does not get going. The 46-page legal document required that the work "continue without interruption" once Sinex started demolishing the former mall. That work finished in early August, and the construction site has been inactive since. There's a "high degree of concern," said Glassberg, who was hired by the city to oversee the project. "We're at a precarious moment." Sinex insists nothing is amiss. "We are in full compliance with all our agreements with the City," he wrote in an email. Within the next few weeks, Glassberg said, the future of CityPlace will likely be determined: Either the financing will come through or the antagonism between the developer and the city will amp up and any remaining goodwill could disintegrate. Sinex owns the property and is the ultimate arbiter of its future. Some smell blood in the water. Two separate developers have informally approached the city, wondering about the standstill and expressing interest in purchasing the property, according to Lunderville. He refused to identify the developers but said both were locals. Erik Hoekstra, a managing partner at the Burlington development company Redstone, acknowledged he might have been one of them. When construction stalled, he told the city to keep him apprised if things went south. "If we can help somehow, let us know," he recalled saying during one of multiple recent conversations with city officials. If he owned the site, Hoekstra said, he would build a substantially smaller project than the one Sinex has proposed. There's little demand for office space in Burlington, and the parking is expensive to build, Hoekstra said. "There's a financial feasibility limitation, and there's a market demand limitation," he said of the CityPlace project. Sinex maintained that he's not selling and remains "completely dedicated to the completion of the project." "Devonwood will work tirelessly to insure that the benefits of this transformative project come to fruition to benefit all project stakeholders as well as the City of Burlington," he wrote in an email to Seven Days. But, he added, "I get everyone's frustration." Sinex has attributed the delays to a series of factors beyond his control. In January, workers found asbestos in an old roof of the mall. In March, a citizens' group challenged the project in court. Those two issues set the schedule back several months, he said, though the mall was demolished over the summer. In August, when foundation work was supposed to begin, Sinex blamed the city for slowing the pace of construction. He said Burlington had been late in handing over the plans for Pine and St. Paul streets, which would be reconfigured as part of the development and paid for with $21.8 million in tax-increment financing. Burlingtonians approved the TIF money at the ballot box in 2016. At Sinex's urging, the city council agreed on August 27 to amend the development agreement so he could get a foundation permit without a contract for the rest of the project. He vowed to restart work immediately, but it has yet to commence. The longer a project languishes, the more risky it becomes, according to Glassberg. Construction delays increase the chances that something will go wrong and can lead financiers, contractors and potential tenants to question their commitments. Sinex has no financing to construct the $222 million project. Instead, he has paid for the work thus far with $56 million in equity financing out of his own pocket and from Brookfield Asset Management, a Toronto-based financier that owns 51 percent of the project and is one of the largest real estate developers in the world. A bank may be reluctant to fork over so much money with a lawsuit looming over the project, according to Burlington-based municipal and real estate attorney Brian Monaghan. The suit, filed by a contingent of city residents represented by attorney John Franco, alleges that the city didn't properly notify the group about amendments to the project and violated the settlement agreement from a previous lawsuit. Sinex hasn't endeared himself to the construction industry, either. Several people familiar with the project said he had fractured relationships with the contractors who work for him, further slowing progress. All refused to speak on the record, though VTDigger.org reported last month that Sinex planned in August to fire the contract manager, PC Construction, but never followed through. Sinex confirmed that PC is still in his employ. Now there's also a danger of losing tenants. Sinex only has one committed to leasing the space, according to Lunderville: The University of Vermont Medical Center, which signed an agreement last year to lease 100,000 square feet of office space — nearly half of the total. The hospital originally planned to move into the building in January 2019. Those at the hospital "share concerns about the unexpected delays and are hopeful for progress," according to Michael Carrese, a medical center spokesperson. The hospital recently revised its contract with Sinex to reflect a December 2020 move-in, another medical center spokesperson said in a follow-up email. The hospital is a key part of the redevelopment plan, according to Lunderville. "If they are not part of the project, it becomes harder to do the project in its entirety," he said. Lunderville and Glassberg have asked Sinex for updates and a specific time line regularly since September, according to emails obtained by Seven Days. On September 26, Lunderville, Glassberg and Mayor Miro Weinberger flew to New York City to meet with an executive vice president from Brookfield Asset Management. Lunderville wanted to discuss the status of financing, the foundation permit and a work plan, he wrote in an email. At that meeting, "the mayor pressed them to continue construction as they said they planned to do," Lunderville said in an interview with Seven Days last week. Weinberger asked that foundation work begin immediately, Lunderville said: "The mayor was very clear. He wants this project to go forward." After a flurry of press inquiries in early October, Sinex wrote that he was "mobilizing for foundation work" and urged the press to "be patient." A month later, nothing has changed, and he's blaming the majority partner in the project for the silent cement mixers. "Once Brookfield authorizes Devonwood to do so, Devonwood will pull the foundation permit and restart the construction work," he said. Sinex would not explain why he had not yet received that authorization. Brookfield Asset Management did not respond to multiple requests for comment. The city can take more concrete steps. The development agreement gives it the right to ask a judge to enforce a time line if Sinex does not hold up his end of the deal. The agreement doesn't offer specifics, but according to Monaghan, the Burlington attorney, that's intentional. City attorneys "can ask the court what they want," Monaghan said, calling it a "pretty good relief clause." More importantly, the agreement is effectively "protecting the city [and] protecting public resources," Weinberger said in a recent interview. It will continue to serve its purpose "either by helping push this project back on track, which I think is a real possibility here, or through the city taking an escalating series of steps in the months ahead," he said. Neither Weinberger nor Lunderville would specify what, exactly, the city is considering — or when. "We don't want to broadcast" our strategy, Lunderville said. Most immediately — and easily — the city could revoke Sinex's encumbrance permit, which allows him to block about 30 parking spaces and other public areas around the construction site. Meanwhile, elected officials who once supported CityPlace have started distancing themselves from the project. City Councilor Dave Hartnett (D-North District) recalled how in 2016 he knocked on doors and made videos on Church Street advocating for the redevelopment. "Seems like we put so much trust and faith into Don Sinex and got nothing in return," he said. "It leaves me bitter." Hartnett recently proposed turning the construction site into a seasonal parking lot. Councilor Jane Knodell (P-Central District) said she hadn't "given up hope" of completing the project without enforcement action from the city. "I'm sure we will redevelop that site," she said, adding, "It may not be exactly the project that got permitted." City Councilor Adam Roof (I-Ward 8) is "advocating for patience." "We can act hastily, we can act aggressively, but where is that going to get us?" he said. "It would be inappropriate; it would be unwise; it would put the city at a disadvantage." Glassberg is cognizant that things could change quickly, but he sees the city as well positioned for whatever happens next. "Strictly from a real estate value, what sits there today is more valuable than it was six months ago," he said, noting that an empty site downtown is much more appealing to developers than "an aging, decrepit mall." The city has one last-ditch option: It can withhold the $21.8 million in TIF dollars for the redeveloped streets around the project. That bill is due upon the project's completion. If Sinex doesn't "meet the city's requirements," Glassberg warned, "the city's not paying for it." Correction, November 9, 2018: A previous version of this story reported the wrong day of the city council meeting. In this episode, Bryan compiles some of the best hit news songs of past year. In this episode, Bryan speaks with a NASA scientist about a historic landing in Burlington. Do the Signs Around CityPlace Construction Site Violate Billboard Law?